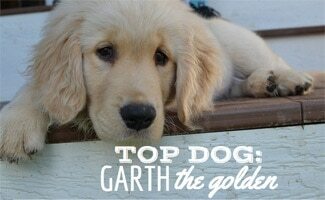 Garth the Golden has a precious face and he has built an impressive social media following in a short period of time. How does he do it all? 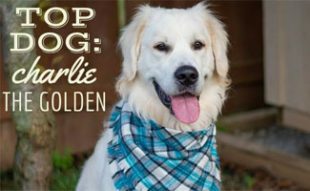 Read on to get to know his story and learn more about the Golden Retriever who is named after one of Country Music’s great legends, Garth Brooks, in our latest Top Dog interview. How did you and your mom find one another? My Mom (Abby) and I found each other through my momma’s cousin Elizabeth. She has my older brother, Tucker who is from Hoosier Heartland Goldens like myself in Frankton, IN. My momma fell-in-love with Tucker and got on the wait list for a boy puppy which thankfully turned out to be ME! I was the last litter of my furry Mom, Lyric and my furry Dad, Clooney (Harborview Goldens in PA). My 3 sisters came before me on Saturday night, May 21st and about 4 hours later around 3 am ET on May 22nd I popped out. How did you get the name Garth Brooks? My momma loves country music and Garth Brooks is her favorite country singer. She always knew she wanted a strong name for me and Garth Brooks the Golden fit me like a cowboy hat. How did you find your way into the spotlight in just 6 months? My momma started my Instagram as soon as I was born and shared pictures from the breeder. When she brought me home I only had around 350 followers, but soon the world fell in love with my lively demeanor and sweet face and I guess since then I’ve just gone viral. Well, I like to think I’m always being adorable, but my Momma keeps saying out loud “I’m on Santa’s Naughty List”. Oopsy daisy! I always like getting into mischief, eating her leftover pizza and frolicking around Chicago with her. I’m a country pup at heart but my Momma and I live in the big city currently, so I’ve got my street cred but also my country charm! My favorite toys are all farm animals. Mr. Cow, Miss Ducky, Mr. Lamb Chops and this furry golden dog toy that looks almost like me when I was a wee little pup. Any recommended grooming tips for keeping such a healthy coat? My favorite celebrity dog is my “brother from another mother” @easton_the_golden! We actually have the same bloodline as we think we found out our dads were brothers. He’s my best furry friend even though he lives in Pittsburgh, PA.
Any tips for puppy parents? Accidents happen, so don’t sweat the small stuff. Always tell your pup how much you love them and take them for as many walks as possible, I love the great outdoors! I keep telling Momma I’d like to be the next Air Bud or be on a dog commercial! I think I have just the face for TV or the big screen. Thinking of retrieving a “Golden” as a pet? 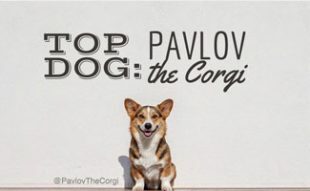 Learn more about the breed in this 6-7 minute video below (including how they make great service dogs!). Thanks Garth and Abby for sharing your story with us! 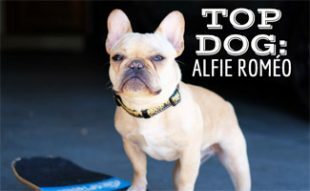 Interested to learn more about this breed? Check out our Golden Retriever breed overview article. 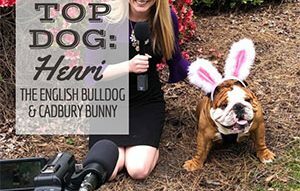 Do you know a famous dog that we should interview for our Top Dog series? Let us know! What a sweet pup, I want a Golden Retriever now!